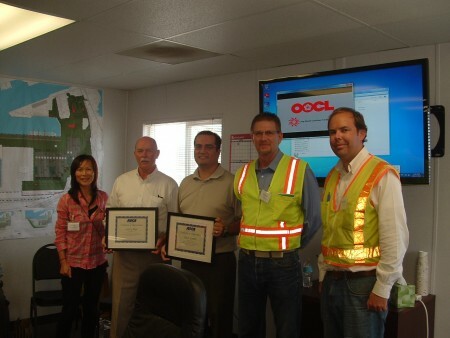 On October 17, 2014, ASCE Orange County's Transportation Technical Group (TTG) hosted an site tour of the automated container terminal, Middle Harbor at the Port of Long Beach (POLB). The tour was an opportunity to get inside the Phase I area of the Middle Harbor terminal before its scheduled turnover to the Terminal Operator this month. The sold out tour started with a boxed lunch and a presentation by Larry Nye (Moffat Nichol) and Cesar Larios (POLB) that covered an overview of the project, the challenges of the design and construction, and some discussion about working and living in a fully-automated terminal world. The tour moved out to the site where the newly installed cranes were being tested. Getting the opportunity to view these giant machines up close was definitely a highlight. The tour finished with a rooftop view of the entire project that showed just how impressive the site is. The Middle Harbor Redevelopment Project combines two aging shipping terminals into one state-of-the-art-terminal to improve cargo-movement efficiency and environmental performance. It is a nine-year, $1.3 billion project to upgrade wharfs, water access and storage area; as well as add a greatly expanded on-dock rail yard. The project will cut air pollution and add thousands of jobs to the economy. When completed, this terminal will have an annual cargo capacity of 3.3 million TEU (Twenty-foot Equivalent Unit). Project construction started in spring 2011 on Phase 1, and now Phase 1 is getting ready to be turned over to the Terminal Operation in November, 2014. TTG would like to thank POLB for hosting this wonderful tour!